A few days ago, I discovered Laxmi Bomb, a Mumbai-based electro-pop band with a new EP out titled Mah’Bharat. Usually, when I come across a new band, I like to close the curtains in my room, switch off all the fans and lights, and sit in the dark listening to their songs on my headphones. However, when I listened to Laxmi Bomb’s music for the first time, something very curious happened. I started to imagine this girl—a middle-class Bombay girl, who speaks English fluently, and whose guilty pleasure, so to speak, is grooving to desi beats; a quintessential Bambaiya who loves to let her hair down, loves parties, and lives to dance. 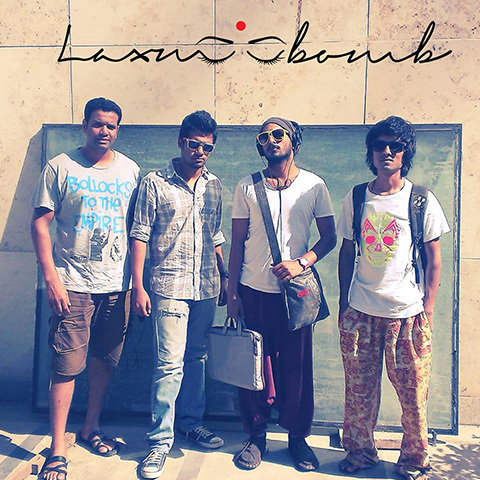 Laxmi Bomb, a four-piece electro-pop band from Mumbai. Even before Laxmi Bomb was formed, the members of the band were fairly well-known in the music circles of Mumbai, having been involved with different bands in the past. Two of them—drummer Levin Mendes and bassist Ruell Barretto—are currently also part of the popular hip-hop/drum ‘n’ bass outfit Bombay Bassment. However, when Laxmi Bomb was formed in September 2013, their particular brand of music was relatively alien to audiences in the city. After a string of strong live performances, the band released their first EP titled Hॐ earlier this year, and now, exactly a year later, they are stoked about releasing their second EP, Mah’Bharat. You can watch the video for ‘Andaman Eve’ here and listen to Mah’Bharat here. Since I started listening to their music last week, I’ve been wondering about the name of the band. Of course, like most people who have grown up in India, I know that a Laxmi bomb is a type of firecracker that goes off with an unexpectedly loud and satisfying bang. But why did the band choose that name for themselves? Kartikeya works as a journalist and is a wannabe musician and photographer. A sports enthusiast, he is always glued to the T.V. whenever Arsenal or Team India are playing.